A stairway access tower is often used to get on and off another object or platform, often on a stage and will often have what are known as outriggers for extra stability. A stairway access tower will make it much easier for a painter or decorator to move around when they are working at high altitudes. You can get custom made stairway access towers that are specifically aimed at helping you to reach awkward areas over a high stairwell. Sometimes the access to certain areas is restricted by the staircase itself and this is another area where a stairway access tower is extremely useful. Many stairway access towers are fairly narrow, which makes them handy for use with difficult domestic stairways as well as commercial ones. A stairway access tower usually has a small platform for safe working with easy access and guard rails that can be adjusted as necessary. There are different sized stairway access towers and you will need to find one that is large enough to reach the top of the staircase you need to work on. Like most other access towers, you should be able to hire a stairway access tower in a size that is suited to the job in hand. There are a good number of access tower companies, many of whom will have a stairway access tower for hire. Alloy towers are lightweight and easy to move around and some are specially designed to be used in narrow passages and for stairwell access. Any stairway tower that is more than 2 metres high has to conform to certain safety regulations and before you hire a tower you should ensure that the company works within the legal requirements. 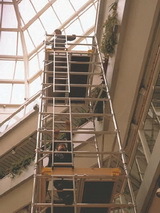 Sometimes a stairway access tower will have a lift up ladder section at both ends to enable the user to work on stairs that are either above or below the tower itself. The best access towers will have spirit levels attached to the platform, making it easier to be accurate about levelling when the tower is in the erection stage. Different suppliers may have a variety of stairway access towers for sale or for hire. While stairway access towers will differ in size and therefore the number of certain components, the above list is of standard components for this type of access tower. You will need to do some research on the various companies that deal in access towers to find one in the size you need for the job in hand. Some suppliers may insist on professional set up for their rented stairway access towers.